Today we commemorate the Memorial of St. Elizabeth Ann Seton. Throughout Biblical history and even today, we sometimes come across people who have endured much within their lives and who, regardless of this, remain strong and devout within their faith. Today we remember St Elizabeth, whom is one such person from whose life, heart and devotion, we can take inspiration within our own spiritual life. Elizabeth was the first native-born citizen of the United States to be Canonized to sainthood. Elizabeth was born as Elizabeth Ann Bayley in New York city on the 28th August in the year 1774, and she was a child of the Revolutionary war. She was raised Episcopalian which was the faith of her parents. Elizabeth married at the young age of only nineteen, to William Magee Seton, who was a young but wealthy merchant and together they parented five children. 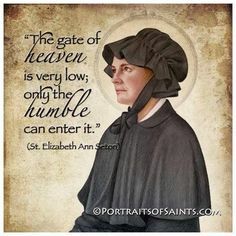 Elizabeth had a very deep faith and concern for the poor even as a young woman and she shared this devotion with her sister-in-law, Rebecca Seton, with whom she became very close friends. Together, Elizabeth and Rebecca would undertake various missions for the poor and needy of their region and they adopted the name of the ‘Protestant Sisters of Charity` for their mission works. Elizabeth’s life changed after only four years of marriage and became rather burdensome in nature. Elizabeth and her husband were left with the responsibility for seven half-brothers and sisters of William’s father when he died in the year 1798. Elizabeth suffered further in the year 1801, when her own father with whom she had a close relationship, especially since the loss of her mother at aged only three, himself passed onto the care of the Lord. Then yet again she suffered after only a further two years, when both her husband’s business and health failed. Filing for bankruptcy, Elizabeth and her husband sailed to Italy to help his health and to try to revive his business. Whilst in Italy, Elizabeth suffered even further, as William’s condition worsened. He was quarantined and subsequently died of Tuberculosis in December of 1803. Elizabeth remained in Italy for several months after his death and during this time, was more fully exposed to the Catholic faith. Elizabeth returned to New York city in June of 1804, only to suffer yet again with the loss of her dear friend and sister-in=-aw, Rebecca Seton, the very next month. At only thirty years of age, Elizabeth had endured the loss of so many who were close to her and she seemed to have the weight of the world upon her shoulders. Even throughout all this, Elizabeth still remained fervent in faith. The months ahead were life-changing for Elizabeth and she seemed ever more drawn to the Catholic faith and to Mother Church, much to the horror of her friends and remaining family who were firmly Protestant. Elizabeth Ann Seton was received into the Catholic Church on the 4th March 1805. Her conversion cost her dearly in the areas of friendship and in support from her remaining family. Elizabeth relocated to the Baltimore area and there she established a school for girls. She also founded a religious community along with two other young women and she took vows before the Archbishop Carroll as a member of the Sisters of Charity of St Joseph. From this time forward, Elizabeth was known as Mother Seton and she left a legacy of care and education for the poor. She even established the first free Catholic school of the nation. In so many ways, the journey into the Catholic faith, helped Elizabeth to much more appreciate and to embrace her faith even more profoundly. Elizabeth was willing to endure all things to follow Christ. In her journal, she even wrote, ‘If I am right Thy grace impart still in the right to stay. If I am wrong Oh, teach my heart to find the better way’. Many of us who have chosen the Catholic faith have experienced some setbacks and have had to endure issues with relationships, but for this brave and devout woman of faith, the cost was even greater. Elizabeth died aged 46 on January 4th 1821 from Tuberculosis and she was Canonized on September 14th 1975. On this your special day, St Elizabeth Ann Seton, Pray for all of us who follow your pathway of faith. Pray that we likewise to yourself will say yes and will accept all that will come to us in the years ahead, and to allow our earthly endurance to further our faith in our Lord Jesus Christ.